What Role can Design Play in Creating Safer Parks? Excerpted from Planning, Designing and Maintaining Safer Parks, produced by Toronto Parks & Recreation. This guide is not intended to be a definitive statement on creating safer parks and open spaces, nor is it intended to serve as a template for the design, operation and use of parks. Designing a park for safety is based on what is generally considered to be good design: it meets the needs of its users; it is diverse and interesting; it connects people with place; and it provides people with a positive image and experience. While good design will not necessarily eliminate perceptions of fear or opportunities for crime to occur, it can create the preconditions for effective control. Has the location and design of the park been selected and planned to take advantage of surrounding land uses? Is the park or areas of the park in the line of sight of nearby houses, apartments, stores or activity areas to assure visibility? 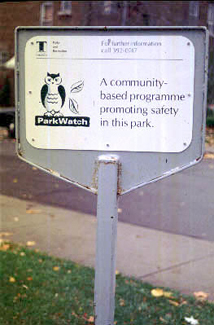 Have 'Park Watch' schemes been considered to encourage surveillance by local residents and merchants? Have measures been considered to lessen the impact of vacant, derelict or problematic land uses nearby a park site? Are activity areas clustered to provide greater informal surveillance within and between areas? Have washrooms been located beside a major activity area, or park entrance to encourage surveillance? Have public telephones been installed in visible locations to reduce feelings of isolation and to improve access to assistance? Is the layout of the park easily understood from the point of view of a first-time user? Are the entrances and exits easy to locate from both inside and outside the park? Do pathways connect with destinations? Does the signage direct users to key points of interest? Are focal points clearly visible? Do obstructed sightlines prevent users from moving comfortably into and around the park? Does the lighting help to direct movement between destinations at night? Visibility is an important factor in enhancing park users' feelings of comfort and security. Perceptions of safety increase markedly if people can see ahead and around them, and if other people are visible. Clear sightlines allows park users to ability to verify the presence of persons which they might find threatening. The ability to see into and out of an area is referred to as visual permeability. The presence of shrubbery, fences, walls, sharp corners, storage sheds or buildings can hinder visibility and thus reduce perceived and actual safety. The degree of visibility that is appropriate has to be evaluated on the basis of the scale, function, context and user group of a park. 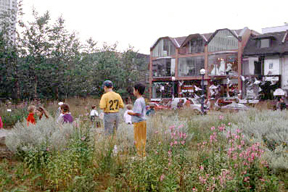 Small neighbourhood and downtown parks usually feel more comfortable if a considerable degree of openness is provided. In larger parks, clear sightlines along the frequently used pedestrian routes, between activity areas and along park edges are also important. Are the edges of the park open enough so that passersby can see into the park and park users can see out? 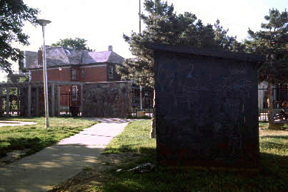 Has at least one activity or facility been located at the perimeter to create an 'active edge' visible from the street? Have nighttime activity nodes been located to take advantage of existing street lighting? Are the entrances highly visible to promote casual use by passersby? Have activity areas such as playing fields, tennis courts, playgrounds been located so that there are clear sightlines between areas to encourage surveillance? Are the washrooms highly visible from nearby activity areas? Have solid walls, tool sheds or plantings that reduce visibility been avoided along primary routes? Has vegetation been planted close to park edges, along walkways or between activity areas that will block sightlines once mature? An opportunity to bypass areas perceived as threatening: A pathway that forces women to walk through an area dominated by adult men or teenaged boys may create anxiety and unease if no other routes are provided. Users must be aware of the alternative routes if their freedom of choice is to be meaningful. An opportunity to avoid movement predictors: Channelized routes, also known as "movement predictors", can be problematic because they create an opportunity for a potential attacker to calculate a person's movement pattern and to predict their destination. Movement predictors can be especially hazardous in isolated areas. Does the park circulation system connect and integrate with the circulation patterns of the surrounding community to encourage maximum use? Are primary access routes clearly identifiable, legible and well maintained? Are access points clearly identifiable from the street and from within the park? Do major circulation routes follow "desire lines" of park users? Are pedestrian and vehicular routes visually connected to provide informal surveillance? Do park users have to travel through areas dominated by groups that might make them feel uncomfortable? Are pathways designed to concentrate pedestrian movement after dark along properly illuminated and well-used routes? Are pedestrian routes to recreational building entries well lit and unobscured by landform, vegetation, structure, signage, etc.? Principal routes to nighttime activity nodes should be clearly identified and their use encourage. These nighttime corridors should be properly illuminated with good visibility to increase the chance of informal and formal surveillance. Is it possible to locate an area of activity adjacent to channelized routes to provide increased surveillance? Does the park function as a shortcut route between major destination points to increase the sense of activity and informal surveillance? Has a 2-3 metre mown edge or low planting been maintained on either side of pedestrian routes to keep a feeling of openness and clear visibility as well as limit potential entrapment areas? Has a hierarchy of lighting types and intensities been used to highlight activity areas and primary pedestrian routes so that they become areas of concentrated use after dark? Has pedestrian lighting been provided at the park perimeter to enhance the park's character, encourage use and to build on the existing street lighting? Are lights positioned to respond to problems of surveillance created by vegetation and topography rather than on the basis of arbitrary light pole placement? Does lighting need to be redirected so that it extends beyond the edge of paths to illuminate potential concealment areas and hiding places? Have lights that cause excessive glare or generate dark shadows been avoided? Has a false sense of security been created by lighting areas that are potentially inappropriate for nighttime use? Has the installation of low ground-level lights been avoided where higher-level lighting is not also provided? Is it possible to light tennis courts and/or playgrounds to make the park safer by encouraging greater evening use? Is the lighting positioned to coordinate with informational and directional signage? Further discussion: The design of lighting in many urban parks is the responsibility of road engineers and too often it is designed for road traffic instead of for pedestrian movement. The illumination standard set for pedestrian walkways, by the Canadian Standards Association, is 0.4 footcandles. Put another way, at this standard a person's face can be identified from 12 to 15 metres away. In addition to adequate illumination levels, a consistent level of lighting with minimal glare is required. Strong, uneven lighting can create crimes of opportunity because users and police focus on the lit areas, but fail to notice activity in the shadows. As well as enhancing the safety image of a park, lighting can be used to increase the publicness of such places by providing a greater range and choice of time in which the park is accessible for use. 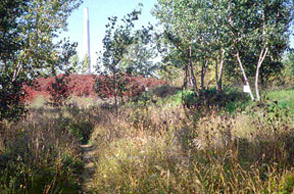 The most successful park spaces offer some degree of diversity in their physical features, activities and users. Such diversity implies interest, pleasure, stimulated senses and varied landscapes (Hough, 1984). Does the park offer a varied environment with a range of colour, texture, shape, fragrance and use? Is the park interesting to visit during different times of the day or year? Are maps located at entry points, activity areas and intersections of paths? Is signage visible from the street to encourage use by passersby and familiarize users with the park's layout and interior facilities? Is there a designated place at the park entrance for special events signage? Has signage been designed as a group of coordinated elements? Is the signage highly visible? Is directional signage visible from at least twenty metres? Have standard graphic symbols been used to supplement text descriptions to assist people who are functionally illiterate or map illiterate? Is the signage accessible to people in wheelchairs? Do signs or brochures provide the following information at regional scale parks: "You Are Here" markers, hours of operation, walking distances between key points, location and hours of operation of washrooms, location of telephones, information on how to access park and police personnel, food concessions, parking and landmarks? Is there information on who to notify to report maintenance problems, vandalism or safety concerns? Has directional signage been used to identify primary pedestrian routes and the destination points of secondary routes? Has signage and lighting been coordinated so that major signs are lit for nighttime visibility? Have signs been located so that planting will not obscure them from view? Have pick-up and deposit boxes been installed to encourage recycling of park brochures. Have telephones been located in well-lit areas where informal surveillance is likely to occur? Will the design of the telephone booth discourage loitering and possible vandalism? Is the telephone low enough for use by children or a person in a wheelchair? Does the telephone have a code number or area locator feature which the caller can relay to emergency personnel to identify geographic location the telephone booth? Has the location of the telephones been coordinated with information signs and lighting? Is it possible to provide parks staff who work in isolated areas with cell telephones? Is there a visible staff presence in a park and can staff be easily identified by their uniform? Are the hours of park staff posted?